Mon. April 29 (10:30 am - 3:30 pm) Lean how to "Quilt with Your Embroidery Machine". The Easy-Connect Quilting files and technique allow you to use your home embroidery machine to get quilting results like you'd see from a long-arm quilter. Students will practice on a small project to learn the technique. Basic embroidery skills needed. Designs are multi-formatted and will work with most home embroidery machines. All machine brands welcome. Design files are available in three sizes. The actual size for each design will vary, but for each size, the designs will be no larger than: Small -- 5.6" x 9.9" (142 x 251 mm) Medium -- 6.7" x 11.7" (170 x 297 mm). Large -- 7.8" x 13.8" (198 x 351 mm) BERNINA users you'll need a Midi Hoop, Maxi Hoop or Jumbo Hoop. Supply list will be emailed to student or a copy may be picked up in store. There is some pre-class prep for this class. Bring a drink and your lunch. 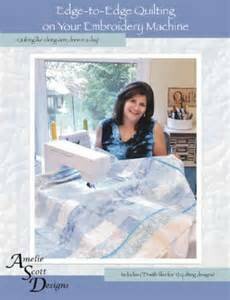 Book and supplies are extra and are to be purchased from BERNINA Sewing Etc.